Plast Aesthet Res 2017;4:150-4.10.20517/2347-9264.2017.52© 2017 OAE Publishing Inc.
Department of Plastic and Aesthetic Surgery, Nanfang Hospital, Southern Medical University, Guangzhou 510515, Guangdong, China. 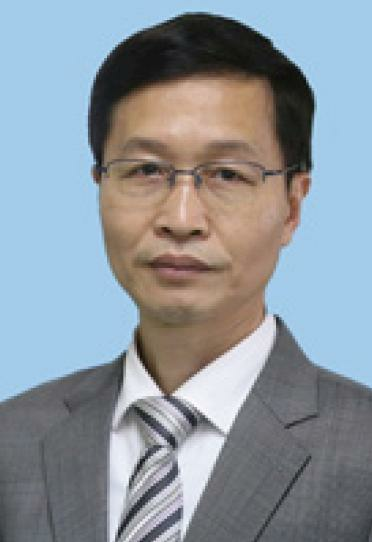 Dr. Zhi-Qi Hu, MD, chariman of plastic surgery of Nanfang Hospital. He have engaged in plastic and cosmetic surgery for more than 20 years. His research interest is advanced basic and clinical facial paralysis, basic and clinical study of hair transplantation. he is experienced in clinical curing for AGA, scar after trauma, and congenital facial deformity. Now he is devoting himself to curing alopecia, including the medicine cure, and the surgical operation - follicle unit extraction (FUE). At present, his research of hair transplantation gets ahead in China and the research of hair follicle regeneration is in the domestic first-class and international advanced level. Follicular unit transplantation (FUT) and follicular unit extraction (FUE) have become two preferred methods in hair transplantation surgery due to their aesthetic and natural postoperative appearance, and high survival rate. FUT and FUE achieve their cosmetic and modification effects by the redistribution of existing hair rather than by increasing the absolute number of hairs. Thus, no matter which surgery method to choose, patients will require detailed evaluation in multiple aspects, including the area of donor site to excise or extract[1,2]. Western scholars have conducted detailed research on the hair distribution of whites and Africans[3-5]. These studies have shown that the hair density of Asians is lower than that of whites and Africans. However, due to geographical and ethnic differences leading to disparities in hair distribution among Asians, it is necessary to investigate the hair distribution in Han Chinese. This paper aims to explore the normal hair distribution characteristics of Han Chinese, in order to facilitate clinical practice. A total of 146 healthy volunteers were Han Chinese residents aged 20-70 years. None had ever received hair coloring, perming, or other treatments. The volunteers and their relatives had no hair diseases, such as androgenetic alopecia, alopecia areata, or hirsutism. Another 41 patients with androgenetic alopecia (AGA) were selected for comparative analysis. All volunteers were informed of the objectives and specific methods of the study, and all gave informed consent. The vertex region (the intersection between the preauricular line connecting the left and right ears, and the line connecting the glabella and external occipital protuberance), temporal region (2 cm above the preauricular line for both ears), and occipital region (centered on the external occipital protuberance) in the volunteers were selected as the observation sites. 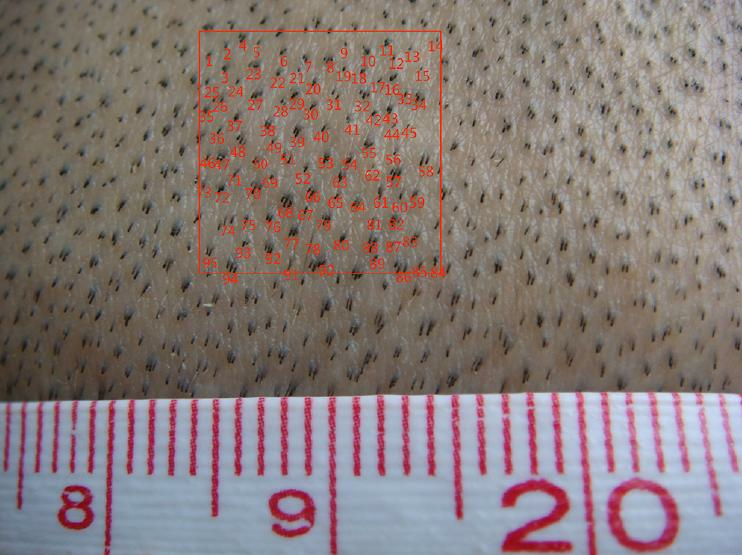 Close-up photographs were taken of 2.5 cm × 1.5 cm areas within the observation regions after the hair within the area was trimmed. 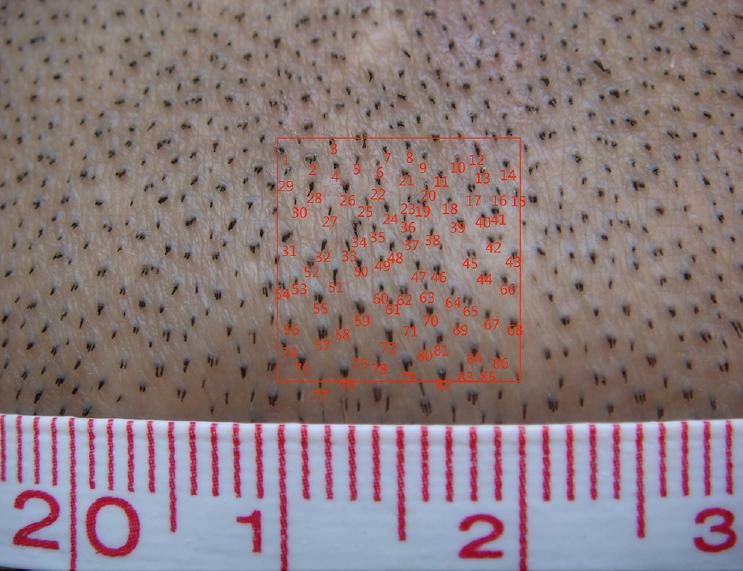 Photoshop CS5 was used to read the images and count the number of follicular unit (FU) types (n1, n2, n3, n4, and n5) comprising of 1, 2, 3, 4 and 5 hairs, respectively, within 1 cm2 of the photographed region [Figure 1]. The following two formulas were use to calculate FU density and hair density: FU density (hairs/cm2) = n1 + n2 + n3 + n4 + n5; Hair density (hairs/cm2) = n1 + 2 × n2 + 3 × n3 + 4 × n4 + 5 × n5. As the vertex and temporal regions of most AGA patients had no hair, these regions had no statistical meaning. Thus, the photography and statistical methods were only applied to the occipital region in this group [Figure 2]. The statistical data were processed in the same way as in the healthy group. SPSS 13.0 software was used for statistical analysis of the data. The measurement data were expressed as mean ± standard deviation. Comparisons between two groups were performed using independent-samples t-tests. Comparisons among multiple groups, such as homogeneity of variance, were performed using one-way analysis of variance (ANOVA) and Bonferroni pairwise comparison. Welch’s approximate ANOVA and Dunnett’s T3 pairwise comparison were used for data with heterogeneity of variance. Correlation analysis was performed using Spearman correlation analysis. P < 0.05 indicated that a difference was statistically significant. The selected 146 healthy Han Chinese included 80 males and 66 females and had a mean age of 44.47 ± 14.53 years. The 41 alopecia patients included 36 males and 5 females, and had a mean age of 41.24 ± 10.71 years. Results are shown in Table 1. The overall FU density of the population was 74.36 ± 13.33 units/cm2 and hair density was 143.33 ± 28.08 hairs/cm2. The differences between males and females (P > 0.05) were not statistically significant. FU density and hair density were high in the vertex and occipital regions but low in the temporal region. The difference was statistically significant (P < 0.001). Results are shown in Table 2. The FU density was 77.78 ± 2.99 units/cm2 and hair density was 148.12 ± 6.98 hairs/cm2, which were lower than the values in the occipital region of healthy Han Chinese. The differences were statistically significant (P < 0.001). Results are shown in Table 3. One-hair FUs accounted for 28.38%, 2-hair FUs accounted for 52.62%, 3-hair FUs accounted for 17.48%, 4-hair FUs accounted for 1.30%, and 5-hair FUs accounted for 0.21%. No FUs comprising 6 hairs and above were found in our sample. To analyze the relationship between FU density at various sites and age, we conducted correlation analyses on the FU density at three sites according to age. The results are shown in Table 4. The FU density at the three sites exhibited negative correlations with age. Headington found that hairs are not uniformly distributed singly, but instead grow as a unit of 1-5 hairs. Each unit has a relatively independent sebaceous gland, erector pili muscles, and perifollicular vascular plexus and nerve fibers, which form a FU. FUT and FUE has been two primary surgical methods for hair transplantation due to their high postoperative hair survival rate and natural postoperative appearance. However, patients detailed evaluation before hair transplantation surgery, including determination of the amount of donor site to excise or extract. Thus, the theoretical support of data on hair distribution density is needed. There are differences in hair among various races. Previous research has indicated that there are substantial differences in hair density among whites, blacks, and Asians. Thus, the populations of various races usually require different areas of donor sites. As the Chinese population is predominantly Han, it is necessary to investigate and study FU and hair density in Han Chinese. Our study found that the mean FU density in 146 healthy Han Chinese was 74.36 ± 13.33 units/cm2. This is lower than the results obtained by Bernstein and Rassman and similar to the result by Tsai et al. (71.78 units/cm2). There were no statistical differences between males and females (P = 0.553). The mean hair density in healthy Han Chinese was 143.33 ± 28.08 hairs/cm2, which is lower than that in whites and Africans. There were no statistical differences between males and females (P = 0.464). The mean FU densities of the vertex, occipital, and temporal regions were 83.32 ± 7.75 units/cm2, 82.66 ± 4.12 units/cm2, and 57.10 ± 2.97 units/cm2, respectively. The mean hair densities were 160.95 ± 20.66 units/cm2, 158.90 ± 13.41 units/cm2, and 110.14 ± 10.17 units/cm2, respectively. These results indicate that there are differences in the FU density and hair density among the different scalp sites of Han Chinese. There was no statistical difference between the vertex and occipital regions, but both had significantly higher values than in the temporal region[7-9]. This provides us with strong data for the theoretical support of temporal hair transplantation. The results on the 41 AGA patients indicate that the mean FU density of the occipital region was 77.78 ± 2.99 units/cm2 and the mean hair count was 148.12 ± 6.98 hairs/cm2. Both results were lower than those in the occipital regions of healthy Han Chinese, and the differences were statistically significant (P < 0.001). Orentreich successfully transplanted non-hormone sensitive hair follicles from the occipital region into the bald area and proposed the donor dominance theory, which has become the theoretical basis of hair transplantation surgery for patients with alopecia. Our research data provide a reference to evaluate the area of donor site that should be transplanted in Han Chinese AGA patients. Our research on the distribution of FU types in healthy Han Chinese found that 1-hair FUs accounted for 28.38%, 2-hair FUs accounted for 52.62%, 3-hair FUs accounted for 17.48%, 4-hair FUs accounted for 1.30%, and 5-hair FUs accounted for 0.21%. No FUs comprising more than 5 hairs were observed in our study. The proportions of FU types are different for different races. Our research indicates that the FU types found in healthy Han Chinese are dominated by 2-hair FUs. The result is consistent with the FU types of whites, whereas the FU types of Africans are dominated by 3-hair FUs. The result of correlation analysis indicated that FU density decreased with an increase in age; therefore, the FU density at the vertex can be used as an indicator to evaluate the degree of aging in healthy Han Chinese. Our research findings have provided some theoretical data on the hair distribution characteristics of Han Chinese. These data can contribute to preoperative evaluation, surgery planning, and postoperative outcome evaluation performed by hair transplantation surgeons. The required amount of hair transplantation, area of donor site excision or extraction, postoperative density, and cost may be estimated, depending on the area of recipient site during the preoperative consultation[11,12]. For example in a male patient with vertex hair loss with a recipient site measuring 2 cm × 2 cm, assuming that all the transplanted FUs survive, the transplantation of 200 FUs can achieve 60% of the normal density of vertex hair. By mean of FUT, this requires a scalp area of about 2.4 cm2 to be excised from the occipital region. By mean of FUE, according the theory that it will be not significantly affect the occipital region appearance after the extraction of 40% the occipital hair follicles, this requires a scalp area of about 6 cm2 to be extracted from the occipital region. The transplantation of 300 FUs can achieve 90% of the normal density of vertex hair. This requires a scalp area of about 3.6 or 9 cm2 to be excised or extracted from the occipital region. We hope that our results can serve as a reference for clinical practice. In addition, we will continue to collect clinical cases to establish a database for hair distribution of Han Chinese for further research. This work was supported by the Natural Science Foundation of China (81471900), the Natural Science Foundation of China (81772104), Natural Science Foundation of China (81701929), Natural Science Foundation of Guangdong Province (2015A030311001), and Science and Technology Program of Guangzhou (201508020262). All volunteers were informed of the objectives and specific methods of the study, and all gave informed consent. The experiment was performed under the approval of the Southern Medical University Ethics Committee. 1. Rose PT. Hair restoration surgery: challenges and solutions. Clin Cosmet Investig Dermatol 2015;8:361-70. 2. Parsley WM, Perez-Meza D. Review of factors affecting the growth and survival of follicular grafts. J Cutan Aesthet Surg 2010;3:69-75. 3. Bernstein RM, Rassman WR. The aesthetics of follicular transplantation. Dermatol Surg 1997;23:785-99. 4. Jimenez F, Ruifernández JM. Distribution of human hair in follicular units. A mathematical model for estimating the donor size in follicular unit transplantation. Dermatol Surg 1999;25:294-8. 5. Loussouarn G, El Rawadi C, Genain G. Diversity of hair growth profiles. Int J Dermatol 2005;44:6-9. 6. Headington JT. Transverse microscopic anatomy of the human scalp. A basis for a morphometric approach to disorders of the hair follicle. Arch Dermatol 1984;120:449-56. 7. Bernstein RM, Rassman WR. Follicular transplantation. Patient evaluation and surgical planning. Dermatol Surg 1997;23:771-84; discussion 801-5. 8. Tsai RY, Lee SH, Chan HL. The distribution of follicular units in the Chinese scalp: implications for reconstruction of natural-appearing hairlines in Orientals. Dermatol Surg 2002;28:500-3. 9. Yang QP, Sheng YY, Xu F. A pilot study on hair growth characteristics of adult male Chinese. Chin J Dermatol 2007;40:74-6. 10. Orentreich N. Autografts in alopecias and other selected dermatological conditions. Ann N Y Acad Sci 1959;83:463-79. 11. Avram MR. Accurately communicating the extent of a hair transplant procedure. A proposal of a follicular-based classification scheme. Dermatol Surg 1997;23:817-8. 12. Bernstein RM, Rassman WR, Seager D, Shapiro R, Cooley JE, Norwood OT, Stough DB, Beehner M, Arnold J, Limmer BL, Avram MR, McClellan RE, Rose PT, Blugerman G, Gandelman M, Cotterill PC, Haber R, Jones R, Vogel JE, Moy RL, Unger WP. Standardizing the classification and description of follicular unit transplantation and mini-micrografting techniques. The American Society for Dermatologic Surgery, Inc. Dermatol Surg 1998;24:957-63. 13. Gharwade CR. Innovative modified hair follicle harvesting technique with reverse rake scalp elevator for lower occipital donor area in follicular unit extraction hair transplantation. Indian J Plast Surg 2016;49:390-6.